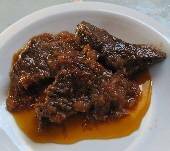 Wild boar meat is generally lean and, once soaked to remove the gamy flavor, is delicious – and can be very tender. I’ve made this dish many, many times, and each time, I’m surprised by how wonderful boar meat tastes in this variation of a traditional tomato-and-oil-based (kokkinisto) sauce. This recipe is for any meaty part of the animal except the head, organs, and innards. Put the meat in a bucket or other large container that is at least five times larger than the piece of meat, and fill to the top with cold water. Over the course of the 10 hours, change the water 2 or 3 times, and in the last change, add 1-2 cups of vinegar to the water to remove any remaining gamy odor. Cut the meat into a few large pieces. Put the meat in a large soup pot, cover with water and bring to a boil. As soon as it starts to boil, turn the heat down to simmer. Foam will start to gather on top of the water. Scoop off and discard the foam, continuing until the water is clear (10-15 minutes). Simmer for 30 minutes more, then remove from heat. Remove the meat from the pot and allow to drain. Pour off two cups of water from the pot and set aside; throw out the remaining water. In a pressure cooker over medium heat, sauté the onions in the olive oil until translucent. Cut the meat into serving sized pieces (size of a small fist) and add to the pressure cooker, browning on all sides. Pour in the wine and stir. Add all remaining ingredients, including the two cups of stock from the first boil, stirring well. 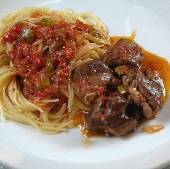 When all the ingredients are blended, close the pressure cooker and cook for 40-45 minutes. Wild boar, like pork, can be paired with cabbage to great effect. If desired, after the meat has cooked for 30 minutes, add 1/2 shredded cabbage and resume cooking under pressure for 10-15 minutes more. 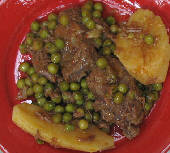 To create a stew (stifado), after the meat has cooked for 30 minutes, add 10-12 small onions and resume cooking under pressure for 10-15 minutes more.